Tired of sweating over your lighting? 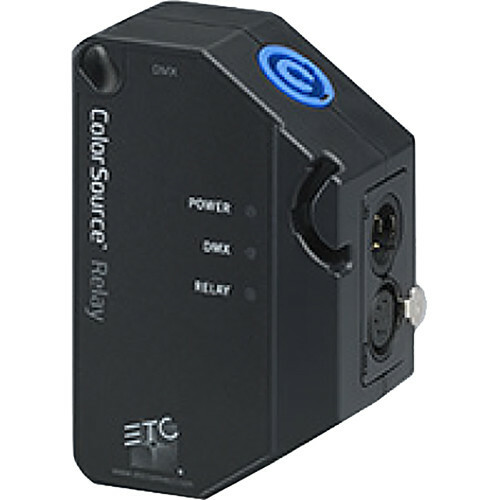 Gain fingertip control of your setup with the ColorSource DMX Relay from ETC. By centralizing power switching and data distribution, the relay greatly reduces time spent on setting up and managing your DMX-compatible lighting equipment. The relay uses 5-pin XLR ports to receive wired DMX signals from your console and deliver these signals to a fixture or daisy-chain of up to 32 fixtures. RDM feedback travels along the DMX connection from the relay back to the console, enabling remote configuration, status monitoring, and management of your RDM-compliant fixtures. With the ColorSource system, your fixtures go on automatically when the relay detects a DMX signal coming from the console. Automated power sequencing ensures that no two relays turn on at the same time across a system. By default, five minutes after data is last detected, all connected fixtures go off. The ColorSource Relay can be easily mounted to a fixture using the included yoke, or to a pipe or wall using standard mounting hardware (available separately). Recommended for use in schools, small theaters, events, automated lighting systems, industrial facilities, conference & exhibition centers, meeting rooms, etc. Box Dimensions (LxWxH) 6.7 x 4.3 x 2.4"